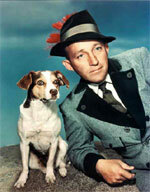 Contrary to popular opinion, this year marks the centennial of one of the greatest entertainers of all time: Bing Crosby. Although born on May 3rd, 1903, a year was shaved off his age early in his film career by his brother Everette (who actually thought he was shaving off two years) so that Bing might appear younger to movie-goers. Consequently, most reports list his date of birth as 1904. But ATOMIC has the inside scoop, and we are proud to pay tribute to this legendary performer’s 100th birthday while the mainstream media is playing catch up. In an amazing career that spanned decades, Crosby’s legacy sadly has been reduced to two items of note: either people think about him only during the holidays for his timeless rendition of “White Christmas,” or they want to know if he really beat his kids. That gives short shrift to an artist who personified the American Everyman on hundreds of albums, as well as on the radio, in films, and on television. All of this by a guy who was raised with a Jesuit education by a strict mother and a happy-go-lucky father. A celebration of Bing’s birthday was held earlier in the year in his hometown of Spokane, WA, and there are plans for a shindig to be held in New York City. With the confusion surrounding his date of birth, the centennial celebration will likely last well over a year. The extended tribute — like the man himself — will be a blessing to us all.